The Ava Skirt is a versatile A-line skirt with two hem length options. Wear it midi with boots for the ultimate in cosiness, or go mini for the perfect work-to-evening skirt. It’s an everyday classic that’ll go with everything and work throughout the seasons – win-win! Ava features darts at the front and back for shaping, a regular centre back zip, narrow waistband and in-seam pockets! Made up of only four pieces, Ava is simple to sew and a perfect starting point for beginner dressmakers, whereas more experienced stitchers will enjoy a quick, satisfying project. See what other people have been making in the Ava Skirt Gallery. The Ava Skirt is a beginner level sewing pattern, perfect for those who know how to use a sewing machine and want to move onto dressmaking. For the Ava Skirt we recommend medium to heavy weight woven fabrics with some structure, such as denim, cotton poplin, cotton canvas, brocade, viscose linen and wools. For the pockets, we recommend a finer fabric such as cotton lawn. To find the perfect fabric, have a look at our specially curated suggestions. 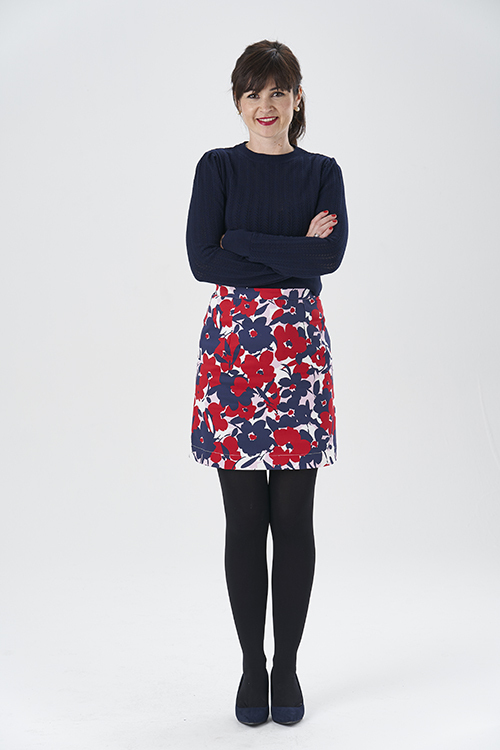 The Ava Skirt PDF sewing pattern is sized between UK sizes 8-20. See the chart for details on fabric requirements. The tiled print-at-home Ava Skirt PDF sewing pattern is 24 pages long.